Portable projectors are nifty, but rarely do they actually deliver the experience you’re hoping for when you buy them. Instead, you get a dull image, bad battery life, no speakers, and you need to cough up another $50 if you have an iPhone because they never have Lightning connectors. The Nebula Capsule By Anker is an entirely different beast. This compact projector is the size of a soda can, but it beams a bright image that measures up to 100 inches diagonally. It also features built-in 360° speakers and wireless connectivity, so you don’t need to worry about carrying cables or Lightning adapters. 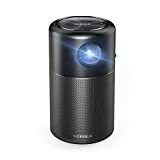 Amazon is offering a healthy $53 discount on the Nebula Capsule today, dropping it to less than half the price of the full-sized Nebula projector. Definitely grab one while you can. Remarkable Clarity and Contrast: DLP’s advanced IntelliBright algorithms deliver remarkably bright (100 ANSI lumens), vivid picture up to 100 inches big. What’s In The Box: Nebula Capsule, power adapter, manual, remote, 12-month warranty and our friendly customer service. NOTE, streaming providers occasionally prevent mirroring copyrighted content.